Get the best service and rates by dealing direct with Kuranda Train & Skyrail. Get your photo taken cuddling a koala (extra charge)! See freshwater crocodiles, meet some monitors, wombats and a variety of wallabies. Experience Australia's first walk-through snake house - it's amazing! Browse through a pioneering family's view of Kuranda's history. Open 9:00am - 4:00pm. Experience the magic and enchantment of Australia's largest live butterfly display..at Kuranda's world renowned Butterfly Sanctuary. Here, in a vast, lushly landscaped enclosure, literally hundreds of brilliantly coloured butterflies will surround you, including the flashing, dancing electric-blue Ulysses, regarded by many as the unofficial emblem of Tropical North Queensland. Wear something bright (either red or white) and entice the butterflies to land on you! Your camera is a must! Open 10:00am - 4:00pm. This pass combines 3 outstanding attractions. What a great way to spend your stay in Kuranda! Great savings for everyone! Make some feathered friends...It's the largest collection of free-flying birds in Australia! See the spectacular birds at Birdworld, at home in their huge flight aviary, superbly landscaped with lakes, ponds and waterfalls. There are more than 45 species of native birds, including Regent Bowerbirds, parrots and the increasingly rare Cassowary. There are international species too, from the earth's vanishing rainforests, including the dazzling and outrageously plumaged macaw from South America. Hand feeding opportunities are available. Again, your camera is a must! Open 9:00am - 4:00pm. 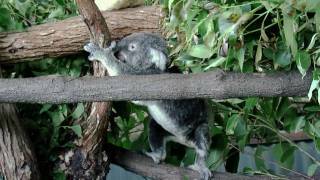 The koala gardens had a great selection of animals to see in a tranquil setting. There were crocodiles, a number of a koalas, sugar gliders, wombats, pythons which you could hold, kangaroos freely hopping about which you could feed and even animals I had never seen before such as the bilby. 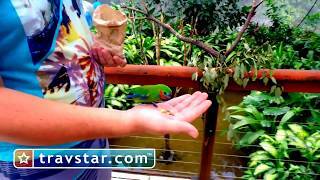 I would recommend a visit here, we enjoyed it much more than the wildlife habitat in Port Douglas. It was the greatest experience. So interactive...they are adorable ..friendly & very cheeky .. the Mc CAws were amazing took my son's water bottle lid from the bottle itself ..while it was tucked into side pocket of his back pack!! Hilarious & my daughter in laws earring from her ear!! Too funny .so be warned people..
We visited Birdworld yesterday, 25th March and had such a wonderful experience. Although it was raining it didn't stop us from enjoying the attraction. We still got to be 'up close and personal' with the feathered friends and were so impressed with the range of birds and sooo many beautiful colours and species. We are locals here in Cairns and can't believe that we have never visited before. We will be back in the dry season and look forward to more happy snaps. What a wonderful experience! We loved the interaction with the various birds and fell in love with the Pineapple Conure who sat and fed from our hands. The variety of birds is amazing and being so close to them is really very special. I was a bit wary of the Macaws... Those things are seriously big! Put precious jewellery away and be prepared to lose the button off the top of your cap! A cheeky ringneck had some success with my son's.